A thousand years ago, on the world of Claire-Agon, a war raged between men and dragons. Culminating a life's worth of work, Eric finally has his mercenary group,The Hunt, recognized by the royal realms of Agon. His first mission: to find the scourge of Highstone Pass. The encounter changes his life forever. Near death, accused of treason, and thought insane by his fellow mercenary leaders, Eric finds himself manipulated as a pawn, caught between the mighty realms of Ulatha and Kesh. Facing a destitute end to his life, Eric must gather together an unlikely group of companions to finish the task he was appointed, and reclaim his honor, but the sinister Kesh wizards, and a deadly, ancient, nemesis, have other plans. 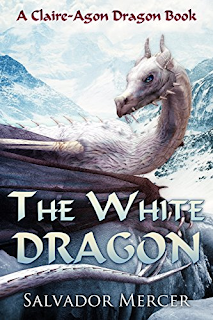 Eric soon discovers that, in the world of Claire-Agon, when dealing with a White Dragon, sometimes ice burns hotter than fire.